Today I had the pleasure of spending time with my dear friend Elba. We met up at Starbucks and had a great time catching up with each other. I only got water, seeing as how it is free, but after a couple hours of just sitting there talking, one of the employees said that she was training and gave us both frappuccinos. I got the java chip, Elba got the caramel. Unfortunately she can't have dairy, but she sucked up up anyway. 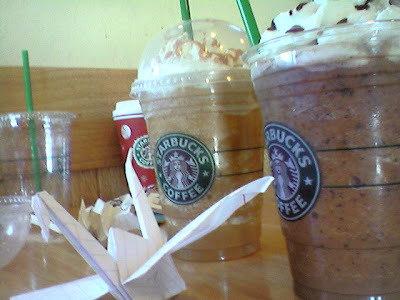 Anyway, long, long story short, here are our free drinks and the crane I made her which she so kindly named Rudy. It was lovely. All of it was lovely.